Water Treatments Maintain optimum water quality and clarity with our wide selection of biological treatments and fish safe dyes. 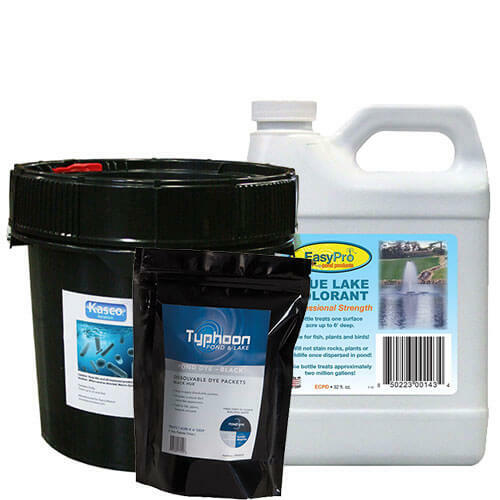 Maintain optimum water quality and clarity with our wide selection of biological treatments and fish safe dyes. The perfect choice to control and eliminate sludge and foul odors in ponds and lakes. These water treatments create a healthy environment breaking down organic sludge and slime, reducing ammonia and nitrite levels and more. A simple and effective way to enhance the natural beauty of your pond or lake. Safely colors water shades of blue or black. Eliminating UV rays that can lead to unwanted clarity issues while also keeping water temperatures lower.